How can Purchase Orders in Online Rental Software help my business? You can use EZRentOut’s online rental software to create and keep track of Purchase Orders – helping you easily define the types, quantities, and agreed prices for items you need and sell. The Procurement Module ensures that orders are processed quickly by creating linkages between items and vendors. You can now have greater control over your dealings with suppliers, print invoices to send on to vendors or keep for yourself, and add custom data to them using custom fields. Watch items get updated as soon as they’re read as received on the system, without the need for any action on your side! To add a new PO, click on the ‘Add Purchase Order’ button on the right of the page. 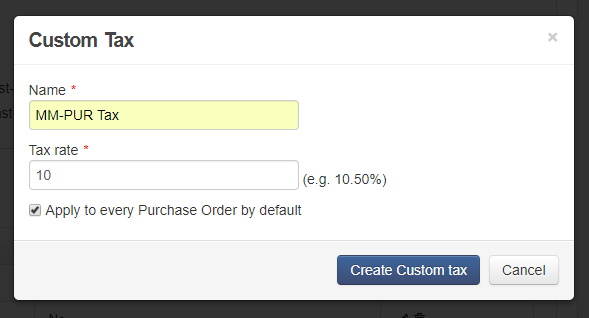 This opens up an overlay prompting you to choose a vendor to create a Purchase Order against. You can also add a new vendor through this overlay if one doesn’t exist in the system. Once this is done, you’ll be taken to the Purchase Order details page where you can fill in all details such as Payment and Shipment Terms (for added details for your vendor), the Delivery Location (referring to the location the received items will be added to), the Description (which will appear on the PO invoice), or PO Notes (additional notes against the PO) – see the image below. Admins can also add multiple items to a Purchase Order using the mass action button on the Items page, speeding up processing times. They can add these to an existing drafted PO, or create a new one right there through an overlay. Multiple custom tax rates can be applied by default to every purchase order. Go to Settings → Company Settings → Tax Details for Purchase Orders → Edit/Create New Tax → Click ‘Apply to every Purchase Order by default’. Hit ‘Confirm Order’ button from the right once you are done with adding items. No more items can be added to this PO now. You can now receive items against this PO. As with all listing pages in EZRentOut, the three vertical dots at the top right can be clicked to customize columns for this page. Uncheck ‘Update product catalog with items received’ if you do not want the system to be updated automatically. The image below shows how the pricing table will be shown after you receive the items. You can also view which items have been received against a purchase order from the ‘Associated Items’ tab at the bottom of the Purchase Order details page. When an order of 5 chairs is received, for example, the ‘Stock Orders’ section will update to reflect the quantity ordered. If 3 of these items are received against the PO, the ‘Quantity by Location’ section will show 5 additional chairs, and the ‘Pending Stock’ in Stock Orders section will show 3 remaining stock. However, the ‘Quantity Ordered’ will remain 5 until the entire order has been received. – A staff user can only add stock requests to active purchase orders that were created by him/her. He/She cannot add them to POs that were created by another user or admin. – Stock Requests Sent will create new purchase orders that will show as pending approval by the admin. A staff user can view the stock requests status from Notification bell > Purchase Orders. A staff user can view all his/her existing and past purchase orders, approval pending POs, and denied stock requests here (see image below). – A staff user can also add more items to an ‘Approval Pending’ purchase order. The option to edit, delete or add documents and comments to a purchase order is also available to the staff user. A purchase order can move through many states in the rental software depending on whether an order has been confirmed, payments made, and the items that have been received against it. You can view all purchase orders, their approval pending and denied updates from More > Purchase Orders or Notifications bell > Purchase Orders. Below, you’ll find a list of all possible states a Purchase Order can pass through. – Drafted: The PO has been drafted. You can clone, delete and void the PO at this stage, as well as add items or edit any details you’d like. – Confirmed Items Pending: This means that the PO is confirmed, but the items ordered are yet to be received. You will not be able to add items to it or edit the price of items, but you can still update delivery dates and custom fields. Note that if both the payment and items are pending in an order, the system will only reflect the ‘Confirmed Items Pending’ status. – Confirmed Payment Pending: The items ordered through the PO have been received, but the payment has not been made yet. This could mean that either a partial payment is pending or the entire sum. – Completed: All activities relating the PO have been successfully concluded, with the items received and the payment made in full. – Void: Although a PO can be cloned at any stage, it can only be voided when it is in the Drafted or Completed state. This will remove all references to the PO from the system, including reports. Please note that if items were created through a PO, they must be first deleted or retired before the PO can be made void. – Approval Pending: Stock requests made by the staff users now pending approval by the admin. – Denied: Stock requests made by the staff users that have been denied by the admin. You can add a PDF link to the Purchase Order directly from this overlay (as shown above). These reports can also be exported as either a PDF or CSV. Alerts help you stay on top of your purchase orders and get notified of actions performed on POs. 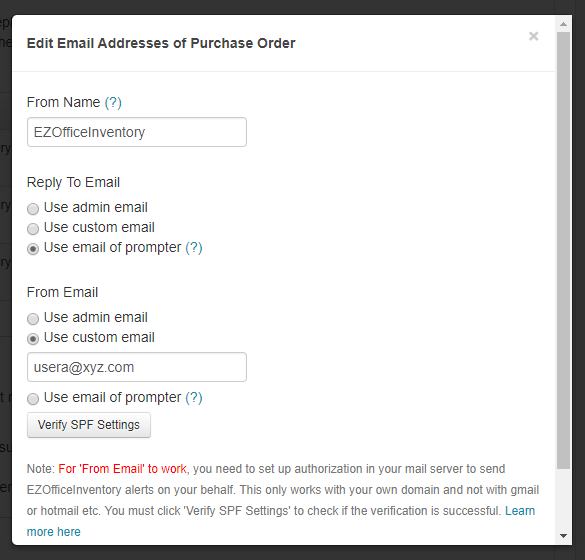 Enable PO alerts from Alerts under ‘Purchase Orders’. You can also stay on top of all your purchase orders from Notification Bell > Purchase Orders. EZRentOut is an equipment rental software, used extensively by organizations and small businesses globally, for streamlined maintenance management to increase business productivity and revenue. For more assistance, drop us an email at support@ezrentout.com. Updated: This post was updated on April 25, 2018, to reflect changes in adding tax rates for purchase orders, giving staff users the ability to request inventory stock via POs, and sending out PO alerts using different email addresses configured in SPF settings. This entry was posted in [Support] and tagged procurement, purchase orders, rental software for po, stock request by admin. Bookmark the permalink.